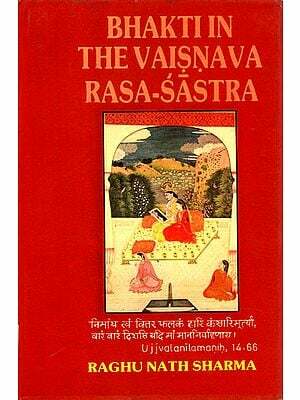 The Number of Rasa-s by V. Raghavan is a seminal work in Sanskrit literary criticism. Rasa is the very soul of poetry and drama. One aspect of it namely. 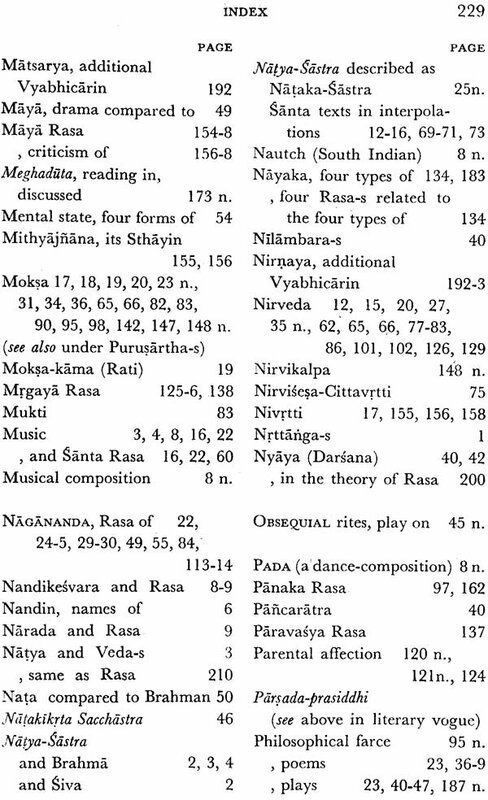 the number of Rasa-s whether it is eight or nine is studied in this work. While considering this problem it necessarily involves the discussion of many important points relating to its nature and scope giving astounding variety of solutions. Rasa-synthesis is another important feature of this work. I GLADLY respond to the desire of Dr. Raghavan that I should contribute a Foreword to this book. He has been carrying on researches in the field of Sanskri t literary criticism for several years past, and the material which he has brought together here shows how extensive is his acquaintance with the literature on the subject. He draws his data, it will be seen, from unpublished manuscripts as readily as he does from published works. The opinion formed on any aspect of the subject by one who has devoted so much time to its study and whose knowledge of it is so wide, is of special value and deserves the careful attention of all scholars. Although Dr. Raghavan considers all these views more or less in detail, the main part of his discussion is concerned with the admissibility of Santa as the ninth Rasa. His treatment of the question is quite compre- hensive, and he examines it both from the historical and the aesthetic sides. A brief reference to each of them may not be out of place. Owing to the uncertainty of our knowledge of the early phases of Indian classical literature, it is not possible to say when poets began to portray this Rasa. The ascetic and mystic elements, however, .which form its distinctive basis, are very old features of Indian life; and they were highly valued by those who followed the teaching of the Veda as well as by those who did not. 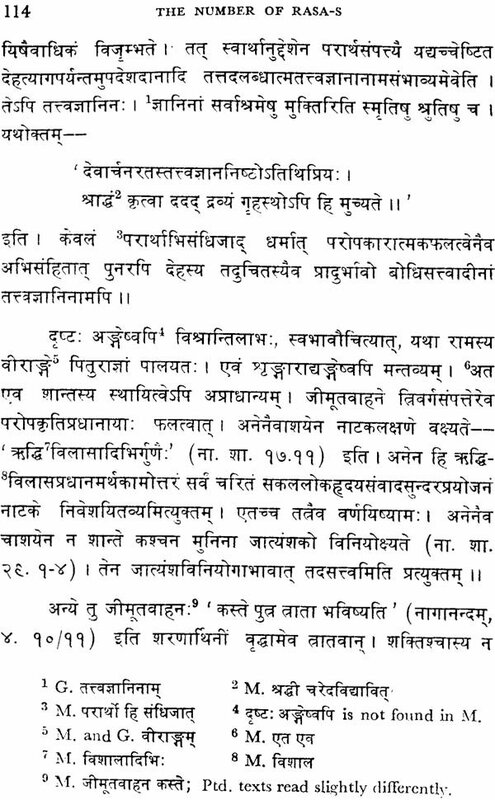 So we may assume that the Santa attitude found expression in literature quite early; and this is corro- borated by the works of Asvaghosa even if, on account of its chronological indefiniteness, we leave out of con- sideration the Mahabharata, the usual example given of Santa Rasa. As regards writers on Poetics, the earliest to recognize it definitely, so far as our knowledge at present goes, was Udbhata. Possibly its recognition by them was even earlier. Bharata's view in the matter is somewhat doubtful, by reason of the unsatis- factory character of the text of the Natyasastra as it has come down to us. 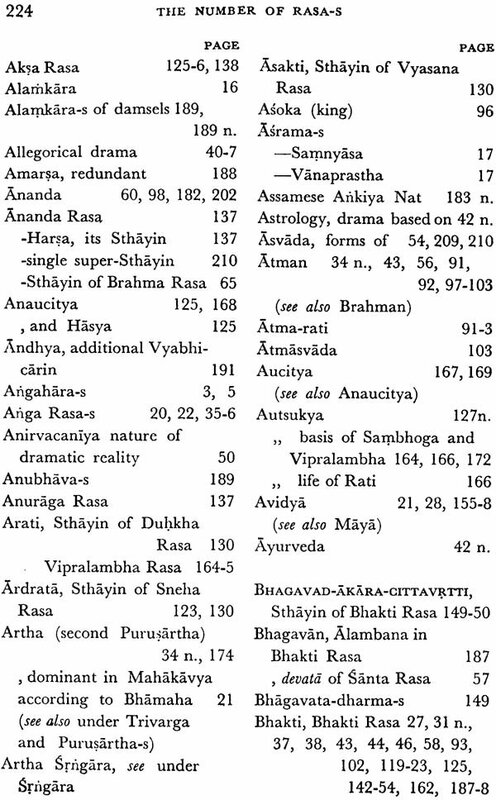 Some manuscripts of it mention only eight Rasa-s, but others nine. 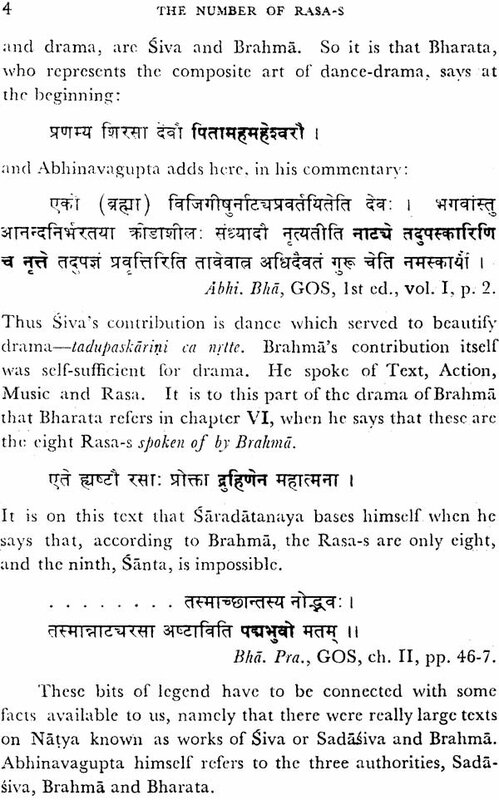 The weight of evidence bearing on the point seems, on the whole, to be on the former side; and Dr. Raghavan adduces several convincing arguments to show that the references to this Rasa in Bharata are all spurious. But it should be added that the Natyasastra contains nearly all the essential points necessary for a theoretical formulation of it. Before we pass on to the aesthetic aspect of the question, it is desirable to distinguish the emotive content or theme of a literary work from the aesthetic sentiment which, according to the prevalent Indian view, its idealized representation evokes in the reader or the spectator. Thus in the case of the Sakuntala, Dusyanta's love for Sakuntala forms the chief theme while the emotion, which it awakens in us as we witness the drama enacted, is Srngara. When we ask whether Santa can be a Rasa, we mean whether situations in life involving the quietistic sentiment lend themselves to be similarly dealt with in literature. If they do, then Santa is a Rasa; otherwise, it is not. The practice of great poets like Kalidasa, which is after all the true touchstone in such matters, shows that Santa situations can certainly be thus delineated in literary works. In the last act of his play, just alluded to, Kalidasa describes the tranquillity and holiness of Marica's hermitage in a manner which affects us most pro- foundly. But, however splendidly depicted, Santa Rasa occupies only a subordinate place there; and a doubt may therefore arise whether it can be the leading sentiment in a work, i.e. whether it can be portrayed in such a manner that it will impress us at the end as the predominant element in the unity of Rasa-s which, according to the Indian view, every work of art is expected to achieve. Some of the works of Asvaghosa, to whom I have already referred, show that it can be so represented. The Mahabharata also, at any rate in its present form, illustrates the same truth, as set forth by Anandavardhana in his masterly way in the last section of his Dhvanyaloka. 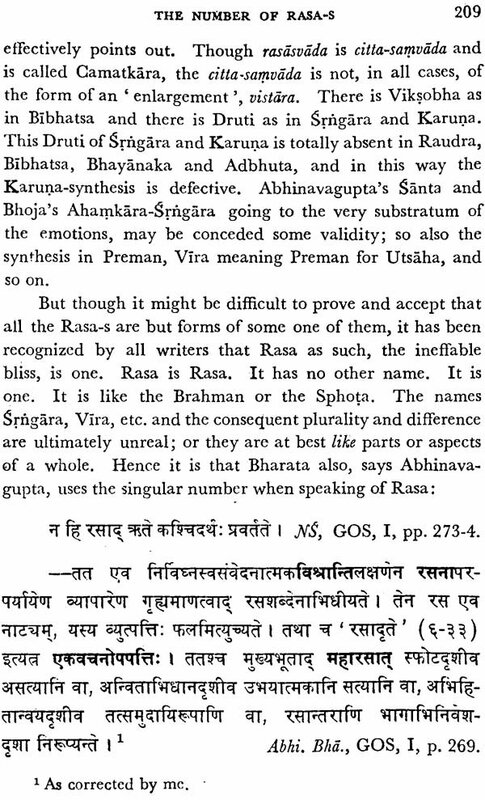 Dr. Raghavan makes a valuable contribution to the study not merely of Sanskrit literary criticism but of Indian Aesthetics as a whole, for the conception of Rasa, though it is here dealt with chiefly in its relation to poetry, is general and furnishes the criterion by which the worth of all forms of fine art may be judged. I have no doubt that the book will be read and appreciated very widely. 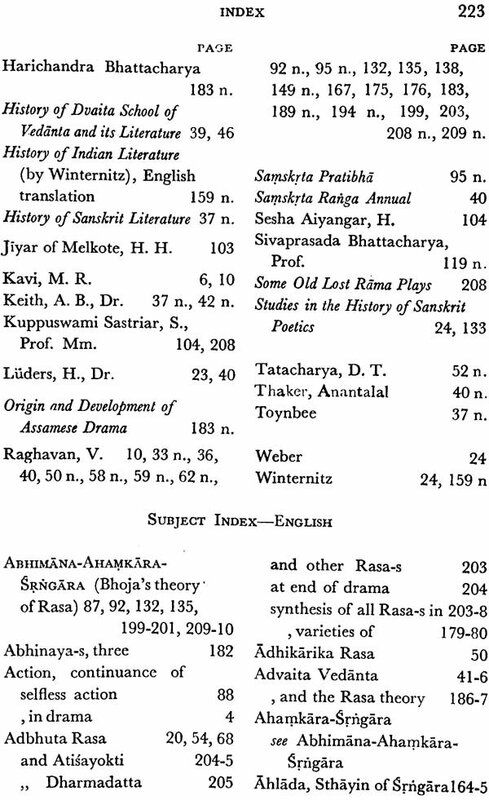 Before The Number of Rasa-s was published in book form by the Adyar Library, in 1940, it had appeared serially in the pages of the Journal of Oriental of Oriental Research, Madras, in the years 1936-37. it was then the first detailed study of the study of the subject and of Santa Rasa in particular. In this, as in my other studies, as Prof. M. Hiriyanna mentioned in the foreword which he kindly wrote to the first edition, I had drown my data from unpublished manuscripts as much as from published works, bringing to light and also bringing together all the crucial textual material bearing on the subject and required for its exposition. In the years that had passed, during which the book has been in wide use, not only have some texts been newly published, but I myself have been continuously noting additional data and portions of the book where the treatment could be elaborated. The present second edition of the book is thus a revised and enlarged one. 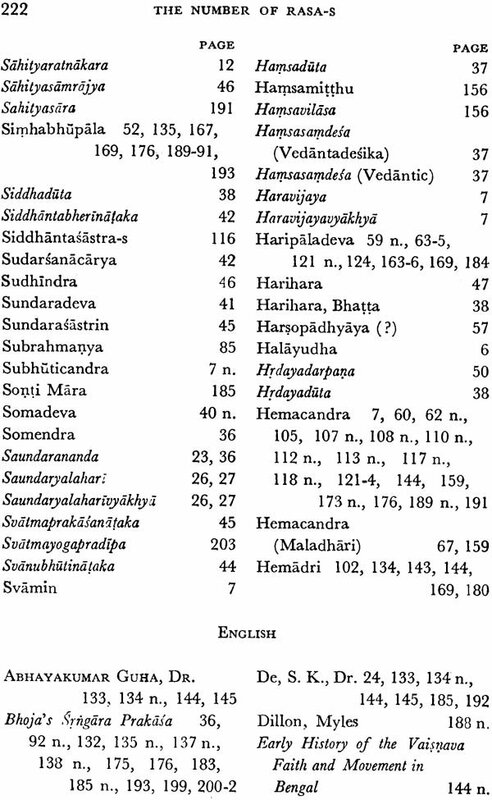 Besides effecting some improvements in the presentation, I have dealt with some additional ideas like the identity of Alambana and Sthayin in Santa, have devoted greater attention to some topics like the treatment of Bhakti by Bopadeva and Hemadri, the Maya and citra Rasa-s, the varieties of vipralambha, particularly Sapa and Karuna-vipra-lambha-s, the daya-vira and the additional Vyabhicarin-s and Sattvika-s, and have also taken into consideration certain additional texts not available formerly. I am thankful to the Adyar Library and research Centre and its authorities for bringing out this second edition, and to its staff and to Dr. K. Kunjunni Raja, for assistance in the course of the printing of this work. Dr. S.S. Janaki has also helped in the reading of the proofs. 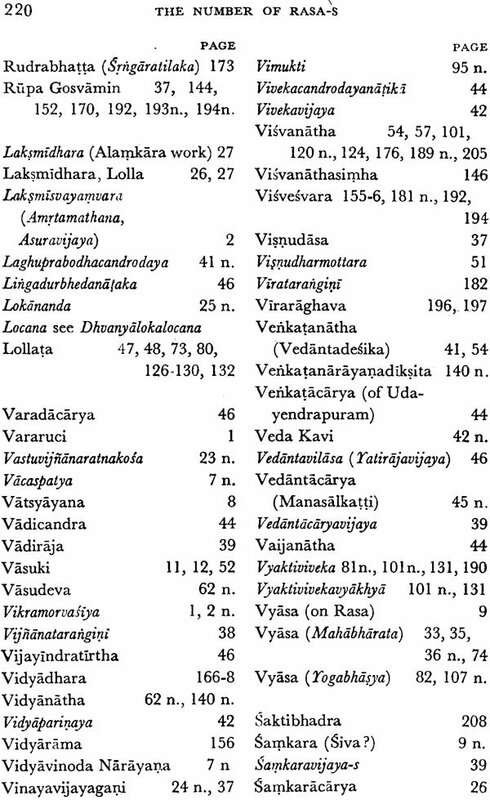 Bharata mentions only eight Rasa-s and Kalidasa knows only eight Rasa'. 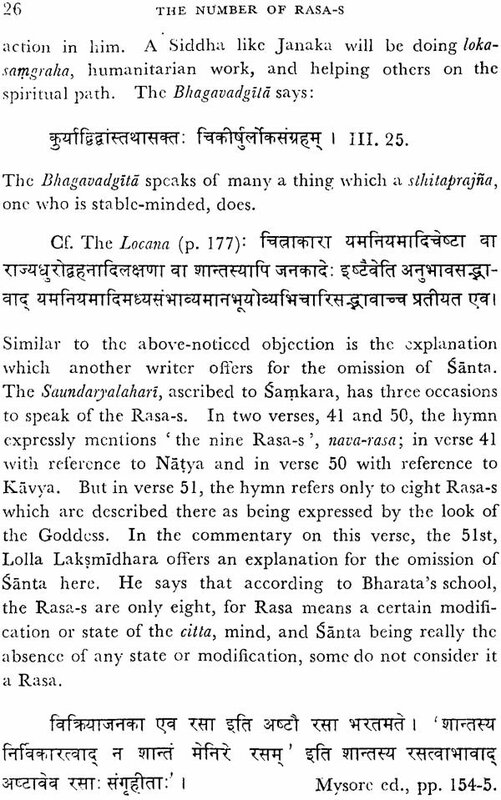 Dandin describes and illustrates only eight Rasa-s (p. 1). 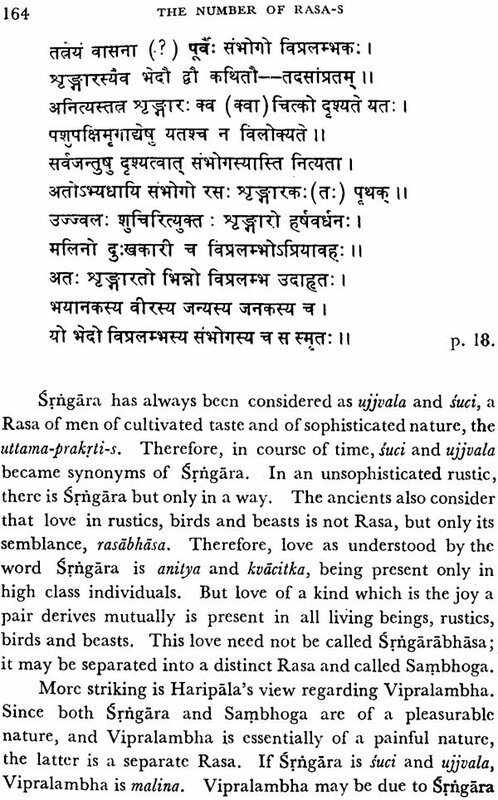 Bharata says that Srrigara, etc. 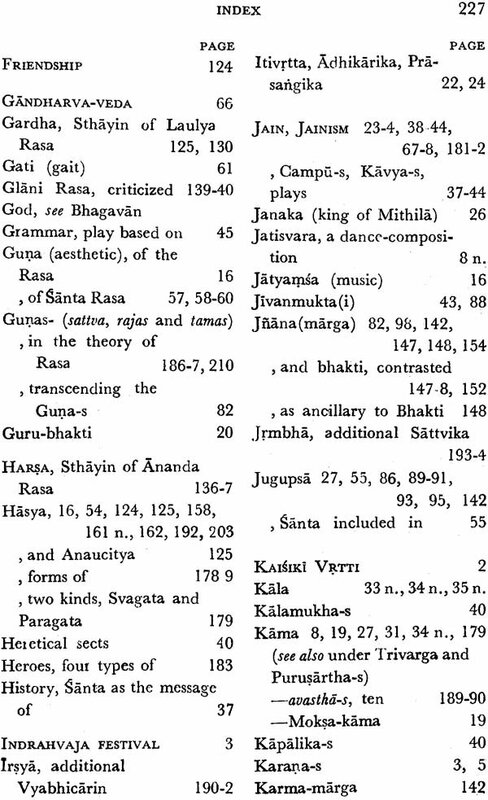 are the eight Rasa-s mentioned by Brahma; the significance of the mention of Brahma, Sadasiva, Bharata and Tandu in the History of Natya literature (pp. 2-5). The question whether Tandu and Nandikesvara are identical (pp. 5-8). 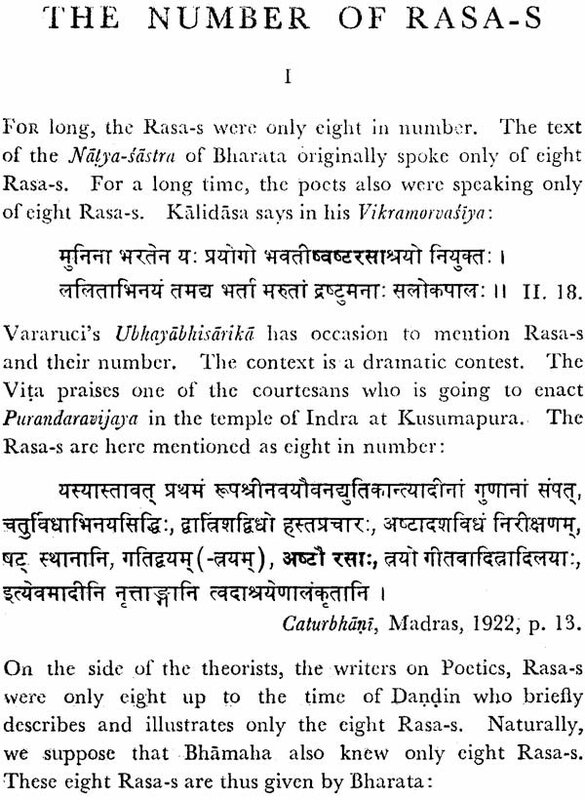 Rajasekhara's reference to Nandi-kesvara as the first exponent of Rasa-s and its explanation (pp. 8-9). 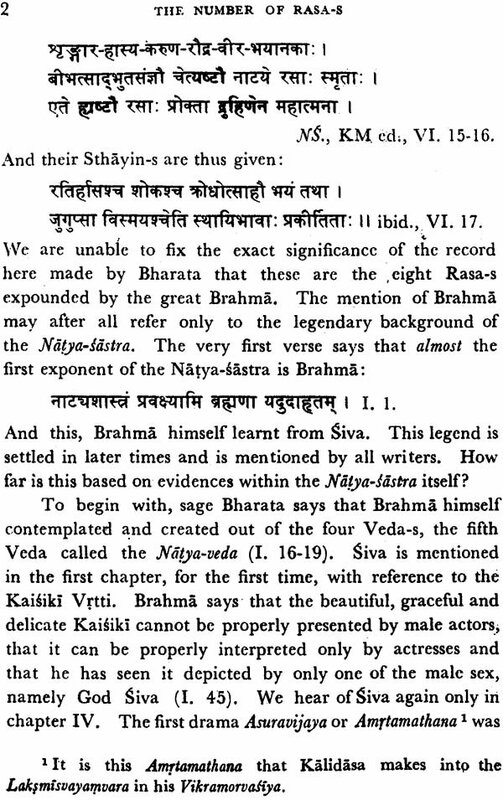 The texts of Siva, Brahma and Bharata (p. 10). Vasuki the first to speak of Santa. 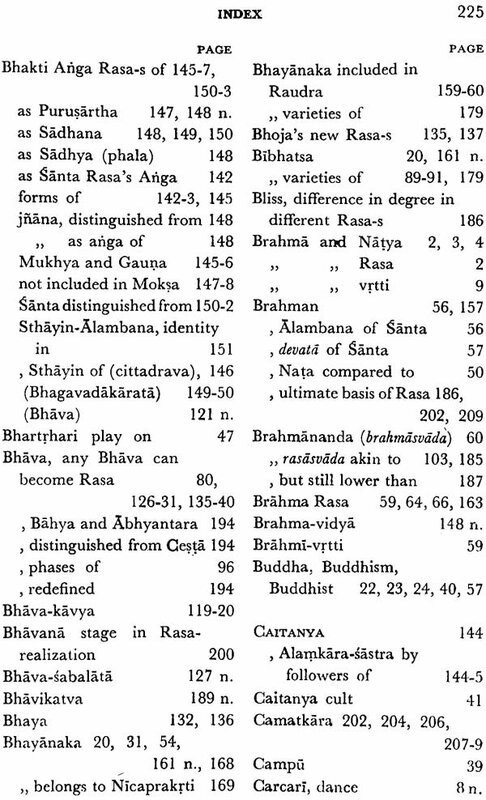 Rasa according to Saradatanaya (pp. 11-12). Kohala and Santa (p. 12). The questions which arise regarding Santa Rasa (pp. 13-14). 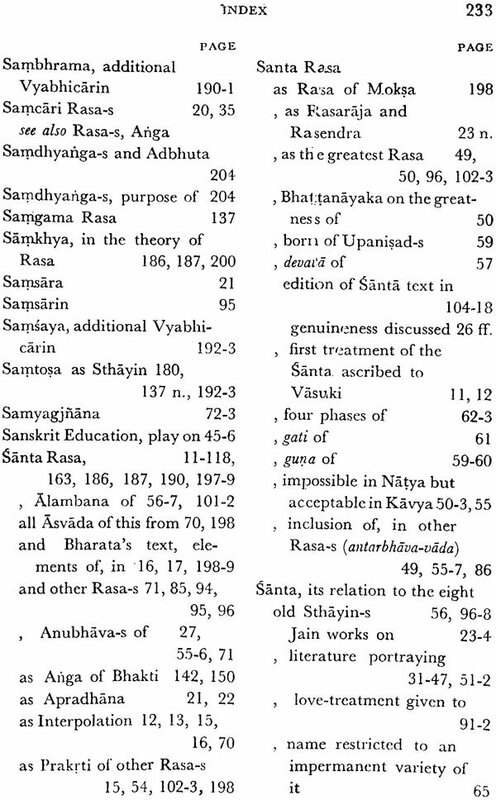 Bharata does not mention Santa Rasa; textual evidences on this; Santa tests in Bharata are interpolations (pp. 15-16). 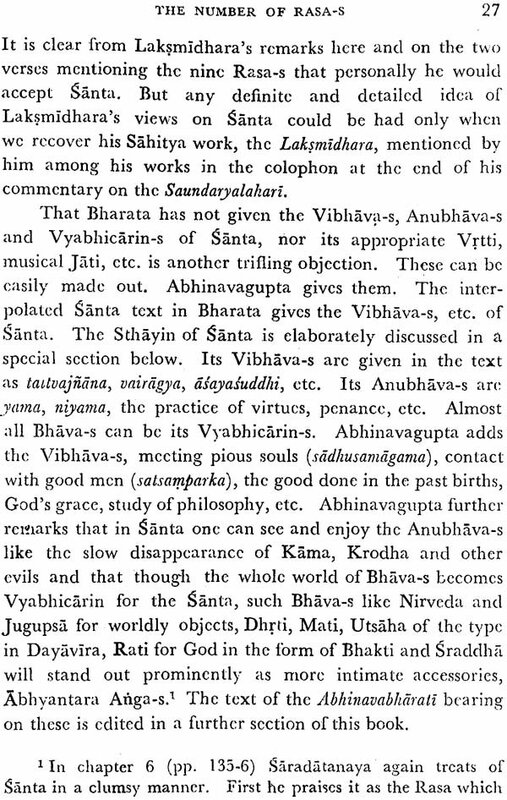 But ideas related to Santa are present in Bharata's accepted text; passages in Bharata recognizing the quietistic element (pp. 16-20). 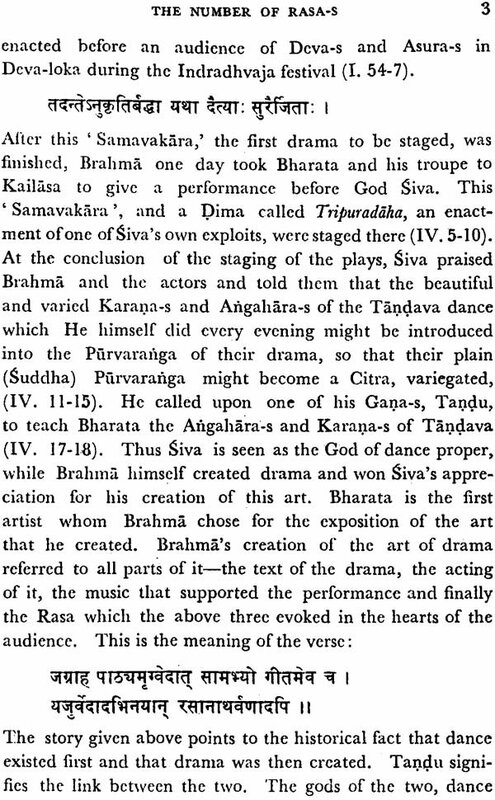 The nature of drama according to Bharata is mainly secular as Abhinavagupta also explains in his commentary (p. 21). The advent of Santa stage by stage; the view of the Candrika on the Dhvanyaloka that Santa can only be a subsidiary motif (pp. 21-2). Probably the Buddhists and the Jains were responsible for making Santa the ninth Rasa. The Saundara-nanda-Kavya, the Sariputraprakarana and the fragment of an allegorical drama of Asvaghosa. The Jain Anuyoga-dvara-sutra of the fifth cent. A.D. mentions Santa Rasa. The probable theorist who may have introduced Santa Rasa: Rahula? 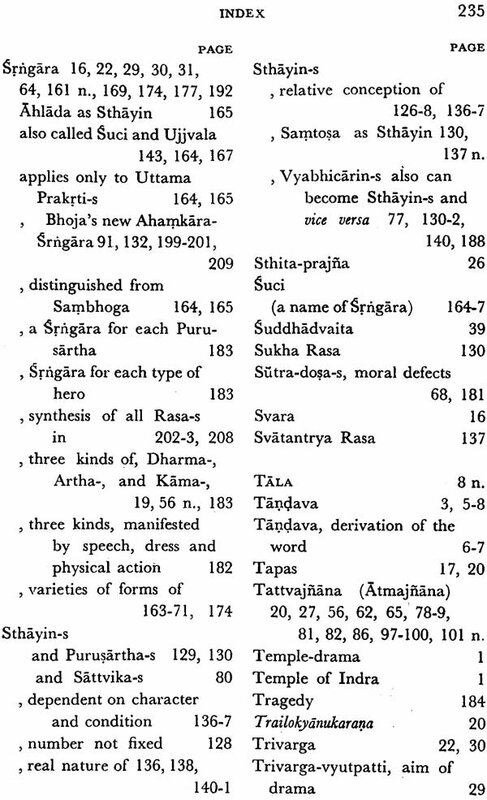 Sriharsa, the Varttikakara? It is likely that it was the play Nagananda which was responsible for starting the discussion on Santa (pp. 23-5). The objections to Santa becoming a Rasa and the replies to those objections (pp. 25-32). Literature depicting Santa: Kavya-s and Nataka-s (pp. 32-47). The writers who accept Santa and those who reject it (pp. 47-55). The view that it is admissible in Kavya but not in drama (pp. 54-5). The view that Santa is a Rasa but can be included in one of the eight old Rasa-s-The Antarbhava-vada (pp. 55-6). The Alambana-vibhava, the Uddipana-vibhava, Daivata, Varna, Vrtti and guna of Santa (pp. 56-9). 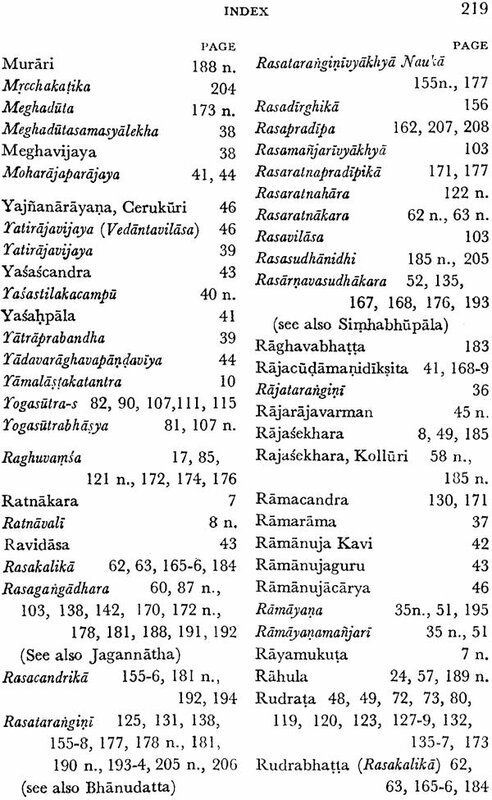 Haripala's Brahmi-vrtti for his Brahma Rasa, the counterpart of Santa Rasa (pp. 59-61). 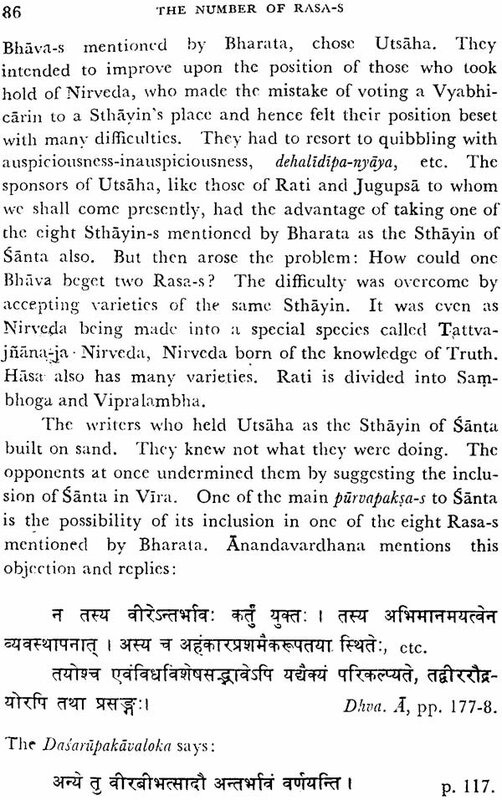 Madhurya, the guna of Santa (p. 60). Gati, etc. in Santa (p. 61). 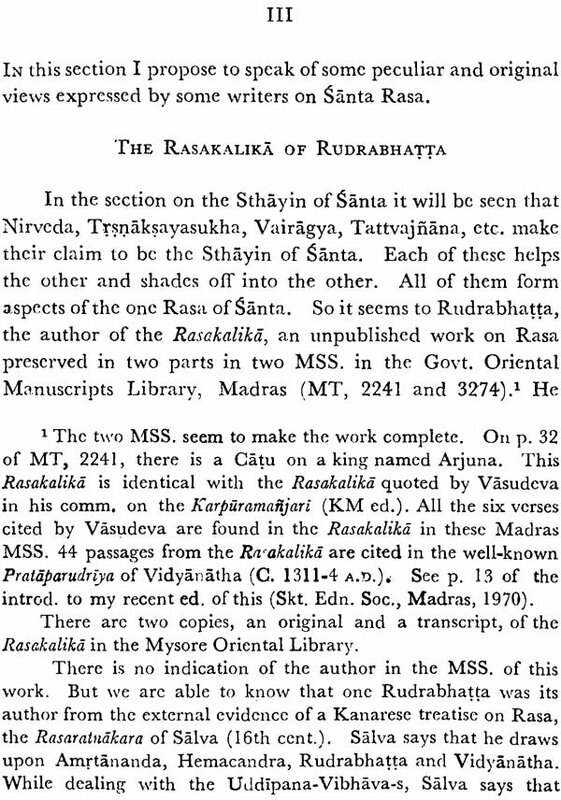 The peculiar and original view on Santa in the (1) Rasakalika of Ruprabhatta, (2) Samgitasudhakara of Haripaladeva, (3) Prapancahrdaya and (4) Anuyogadvara-sutra (Jain) (pp. 62-8). 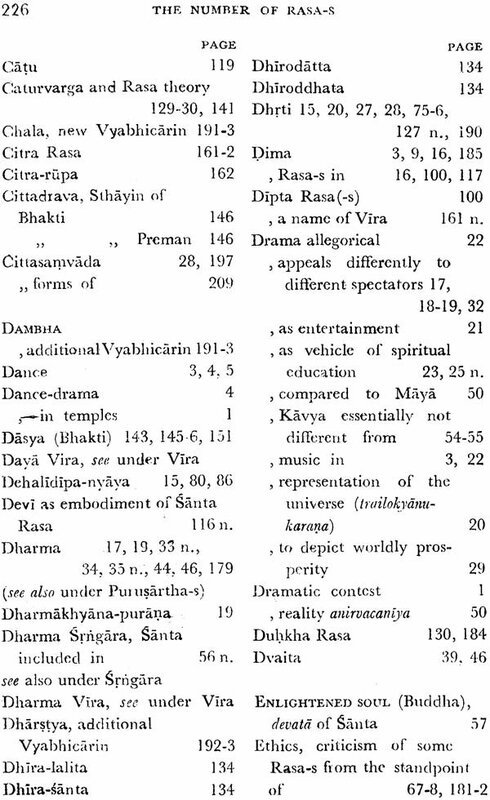 Discussion of the several Sthayi-bhava-s proposed for Santa Rasa: Sama, Samyagjnana, Trsnaksaya-sukha, Sarva-cittavrtti-prasama, Nirvisesa-cittavrtti, Dhrti, Nirveda, Utsaha, Jugupsa, Rati; any one of the remaining Sthayin-s; all the eight Sthayin-s together; and Atman or Atmajnana or Tattvajnana (pp. 69-101). 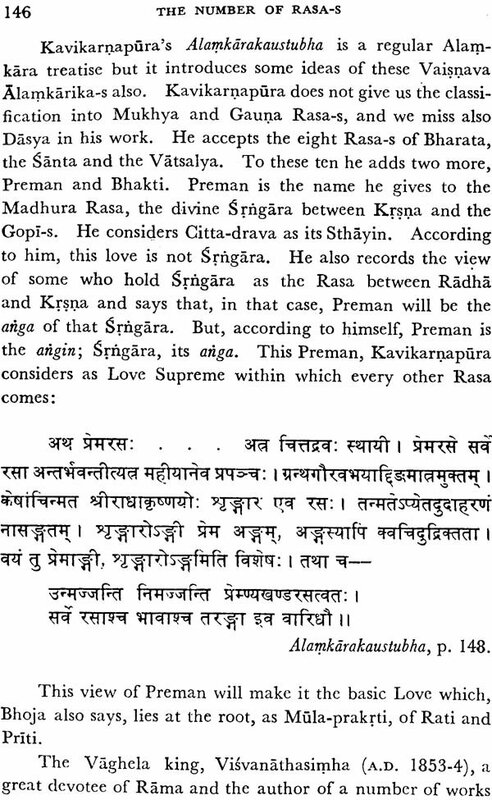 Preyas and Vatsalya; their Sthayin-s; controversy over these Rasa-s (pp. 119-23). 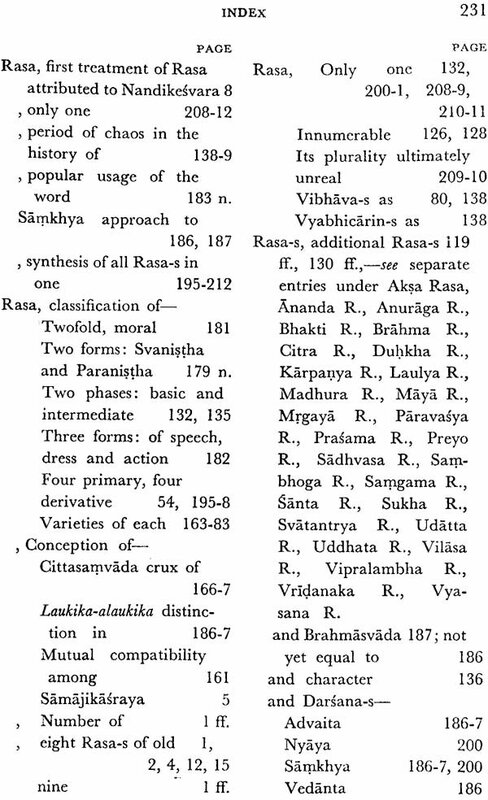 Bhoja's view of Rasa in the Sarasvatikanthabharana and Srrigaraprakasa. 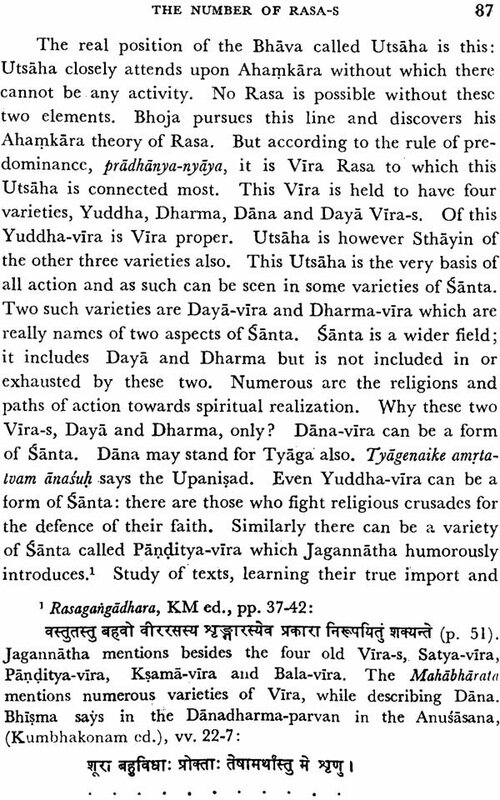 His Udatta and Uddhata Rasa-s; his acceptance of Santa and Preyas. These four Rasa-s are accepted for the four types of hero: Udatta, Uddhata, Lalita and Santa. 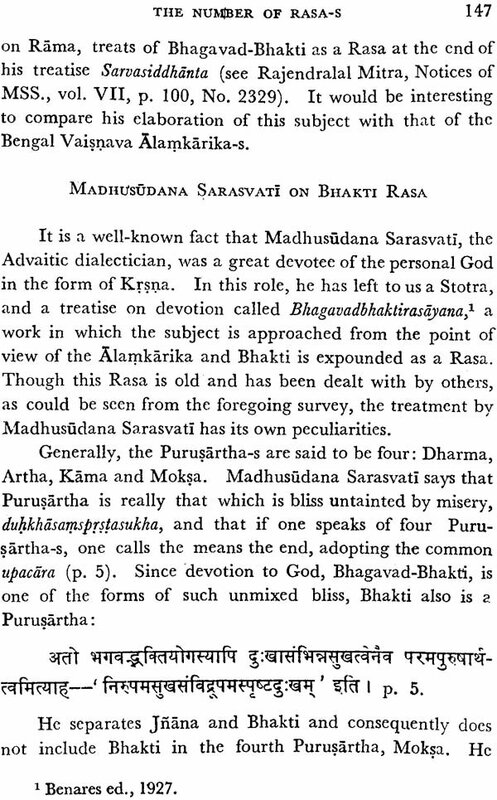 His acceptance of Rudrata's position; not only Vyabhicarin-s and Sattvika-s, but many other states like Svatantrya and Paravasya are considered as Rasa-s by Bhoja. The largest number of Rasa-s to be seen in Bhoja. The accommodation of this view in his main theory of one Ahamkara Rasa. Bhoja's critique of the old view that only a few, Rati, etc. are Sthayin-s (pp. 132-8). 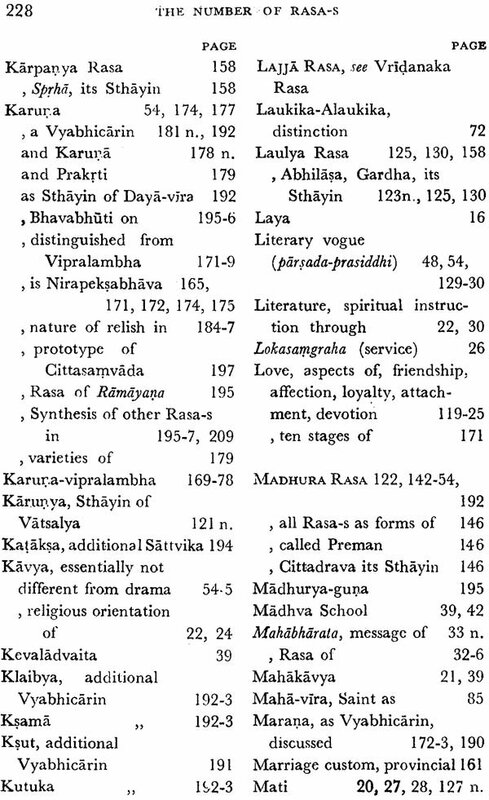 A state of chaos in the world of Rasa, recorded by Abhinavagupta in his Locana (p. 138). 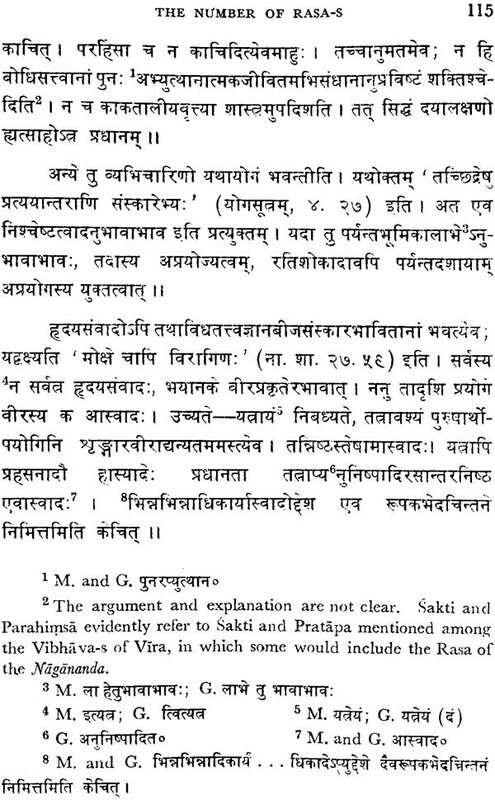 Criticism of the above view; clear statement of the theory of Sthayibhva and Rasa, according to Bharata and Abhinavagupta (pp. 139-41). Jagannatha Pandita proposing to stick to Bharata to avoid a complete overhauling of the system (pp. 141-2). Bhakti and Madhura Rasa-s; Bopadeva and Hemadri on Bhakti; the Vaisnava Alamkarika-s of Bengal (pp. 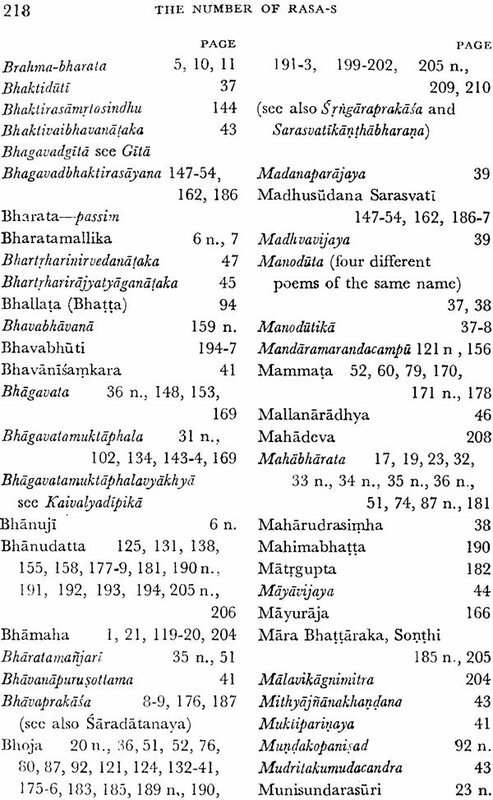 147-7); Madhusudana Sarasvati on Bhakti Rasa (pp. 147-54). The Maya Rasa-Bhanudatta and his commentator Gangarama Jadi; the Rasadirghika, the Mandaramaranda-campu, Hamsamitthu, Visvesvara, and Ciran-jivibhattacarya (pp. 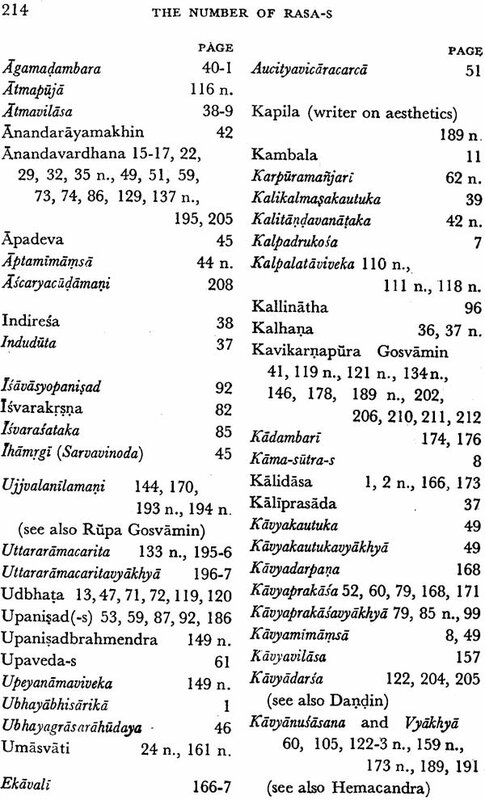 154-8); the Karpanya Rasa (p. 158). 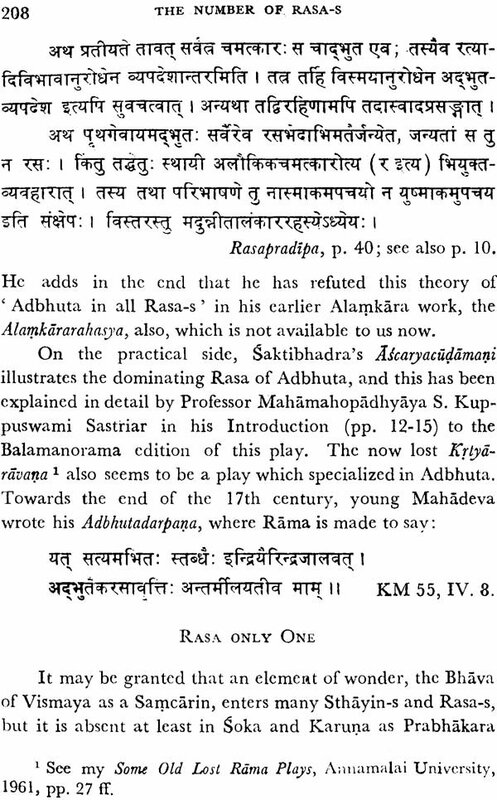 The Vridanaka Rasa in the Anuyogadvarasutra and its commentary by Maladhari Hemacandra (pp. 158-61). The Citra Rasa (pp. 161-2). 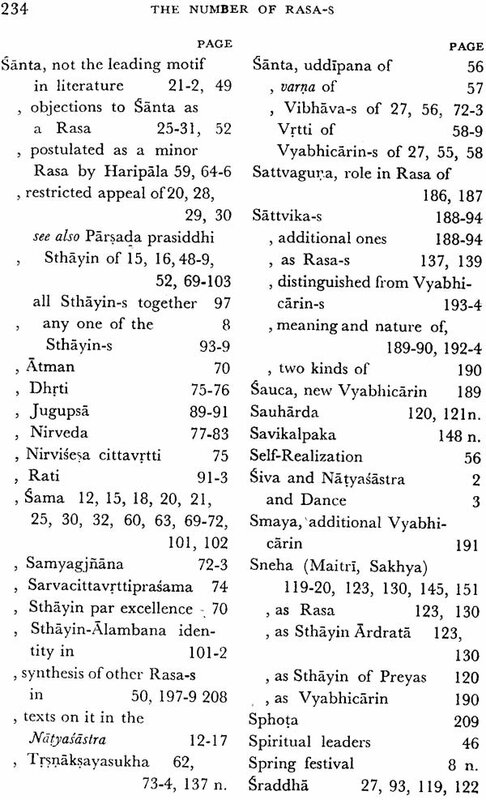 King Haripala's three different Rasa-s, Srrigara, Sambhoga and Vipralambha. 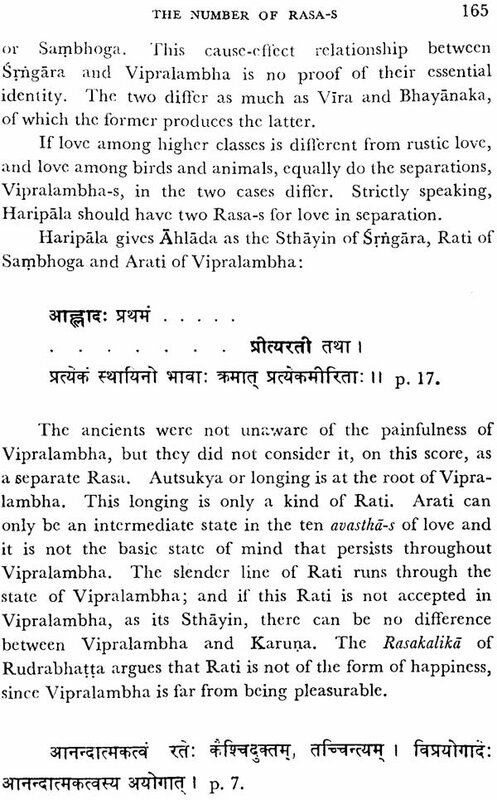 The question of Rasa-bhasa; the question whether all Rasa-s are pleasurable; Vidyadhara versus Simhabhupala on Rasabhasa; the Rasakalika Holding some Rasa-s to be painful (pp. 163-9). 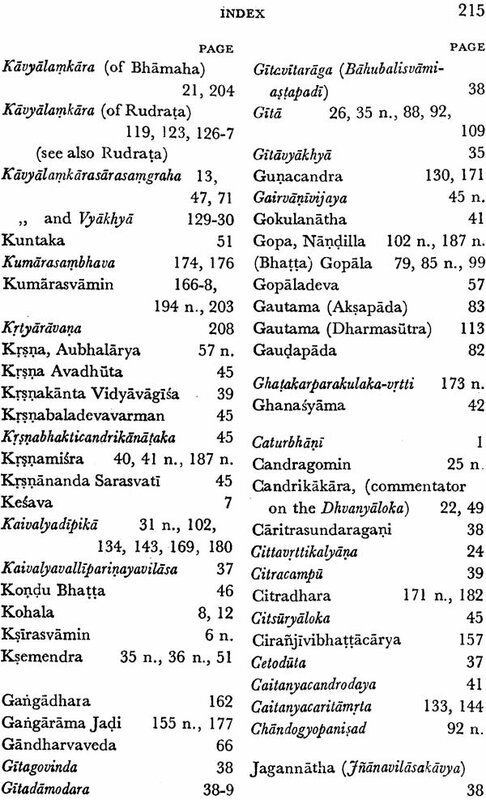 The varieties of Vipralambha; discussion on Sapa and Karuna-vipralambha; view of different writers on these two: Bopadeva, Hemadri, Jagannatha, Mammata, Allaraja, Bharata, Abhinavagupta, Rudrata, Rudra Bhatta Dhanamjaya and Dhanika, Bhoja, Hemacandra, Simhabhupala, Bhanudatta, and Gangarama Jadi (pp. 169-78). 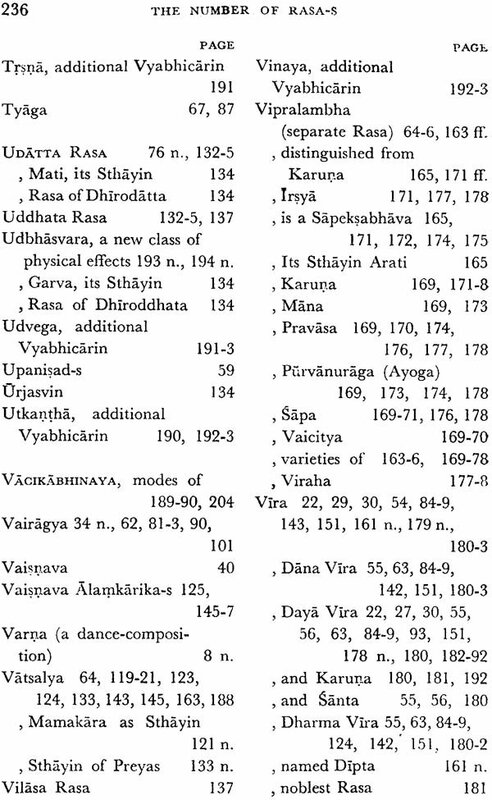 The varieties of Hasya, Karuna, Bhayanaka, Bibhatsa, and Adbhuta (pp. 178-180). 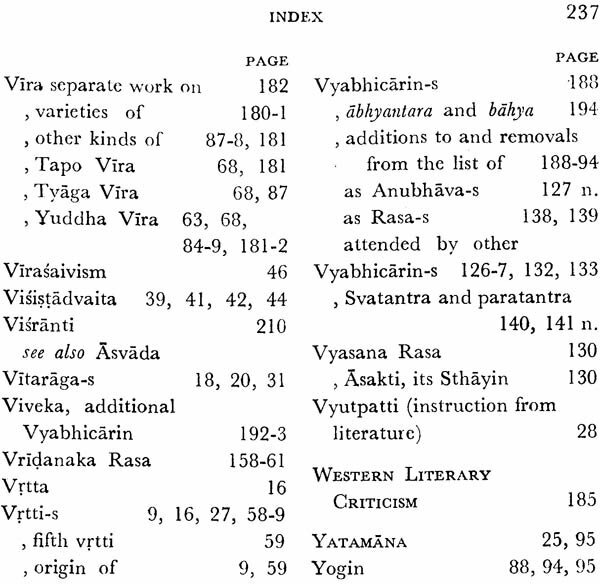 The varieties of Vira: Dana-, Dharma-, and Yuddha-Vira-s; Daya Vira; history of Daya Vira; Jagannatha on the possibility of numerous other Vira-s The Anuyogadvara-sutra and Citradhara's Viratarangini on Vira and its varieties (pp. 18-2). VIII ARE ALL RASA-S PLEASURABLE? 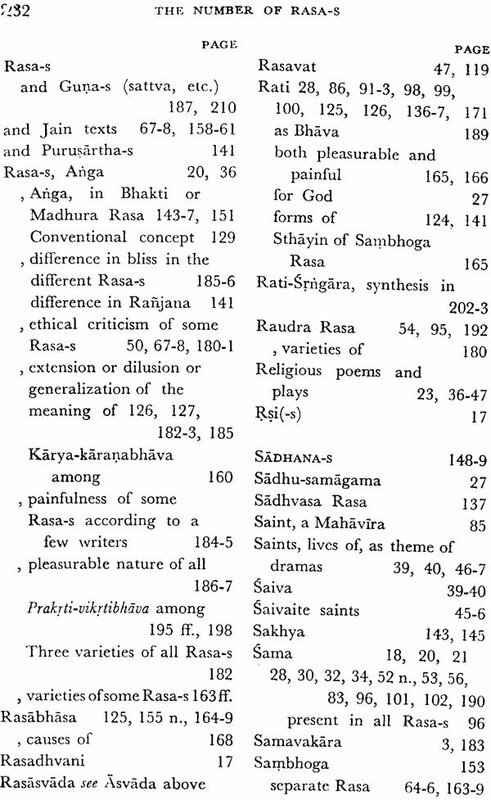 The question whether all Rasa-s are pleasurable or are there some which are painful, and its relation to the Number or Rasa-s. the Natyadarpana, the Rasakalika Sahityamimamsa and a few other less known works hold that some are painful (pp. 184-5). Madhusudana Sarasvati's consideration of the question of bliss in Rasa from the viewpoints of the Samkhya and the Vedanta. All Rasa-s are pleasurable (pp. 184-7). Examination of the three categories of Bhava-s distinguished as Sthayin, Vyabhicarin and Sattvika. Reduction of the Vyabhicarin-s and additions to the same (pp. 188-9). 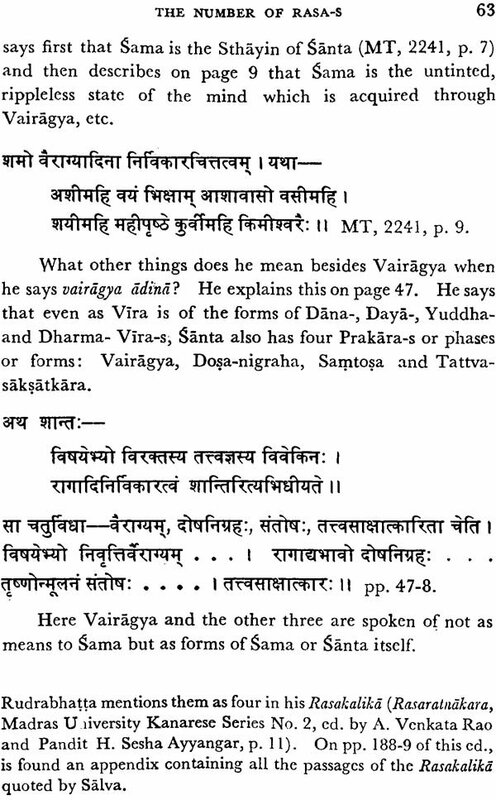 The distinction into Vyabhicarin-s and Sattvika-s. The addition to the set 'Bhava, Hava, etc.' 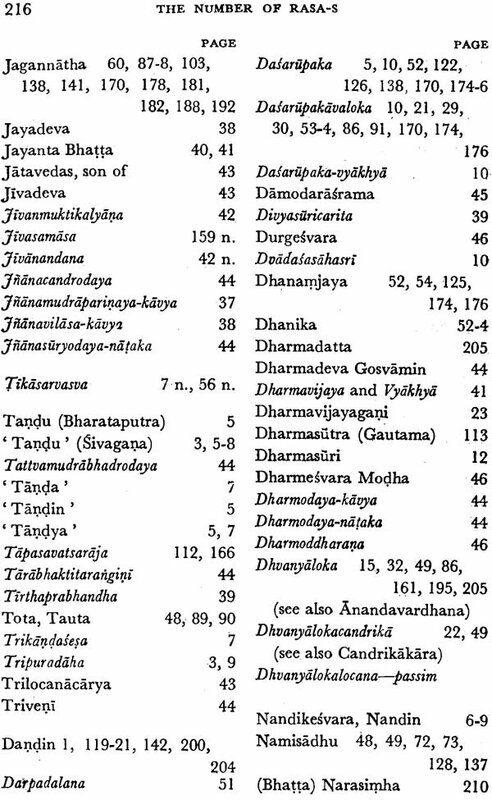 by Rahula, Padmasri, Bhoja and Visvanatha. 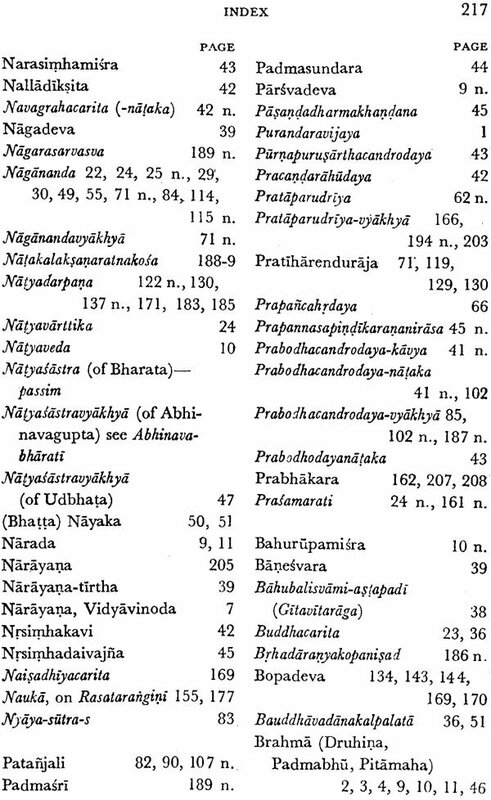 Bhanudatta's inclusion of the ten Madana-avastha-s in Vyabhicarin (pp. 189-190). 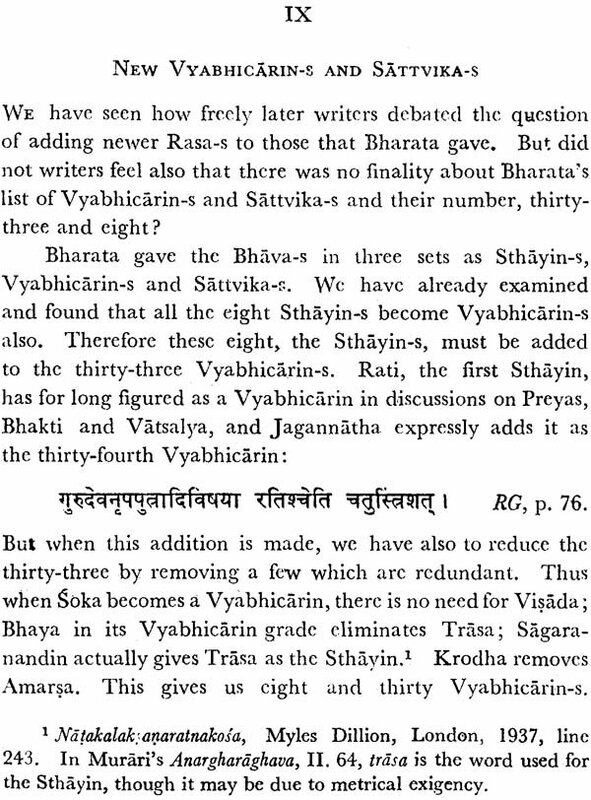 Additional Vyabhicarin-s discussed by Bhoja, Sarvesvara, Hemacandra, Simhabhupala, Bhanudatta, Jagannatha, Rupa and Visvesvara (pp. 190-2). 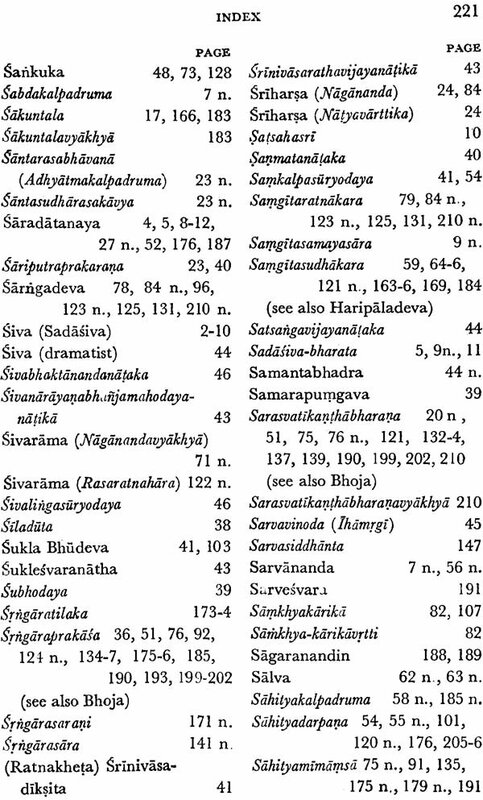 The meaning of the name Sattvika. 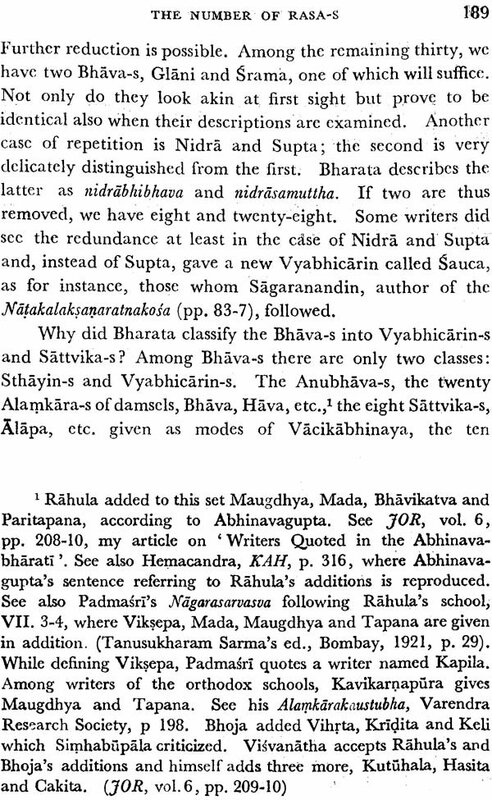 Bhanudatta's additional Sattvika, Jrmbha; Visvesvara's Kataksa; the 'Udbhasvara' class in Rupa Gosvamin; Bhanudatta's distinction between Bhava and Cesta (pp. 192-4). 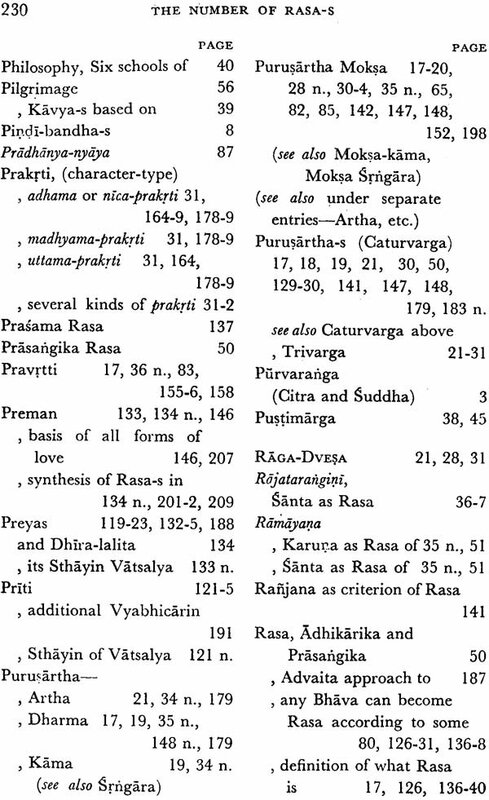 Attempts at postulating one Rasa as the prakrti and the rest as vikrti-s (p. 195). The Karuna-synthesis and Bhavabhuti (pp. 195-7). The Santa-synthesis of Abhinavagupta (pp. 197-9). The Ahamkara-Srrigara-synthesis of Bhoja (pp. 199-201). The Preman-synthesis of Bhoja (pp. 201-3). 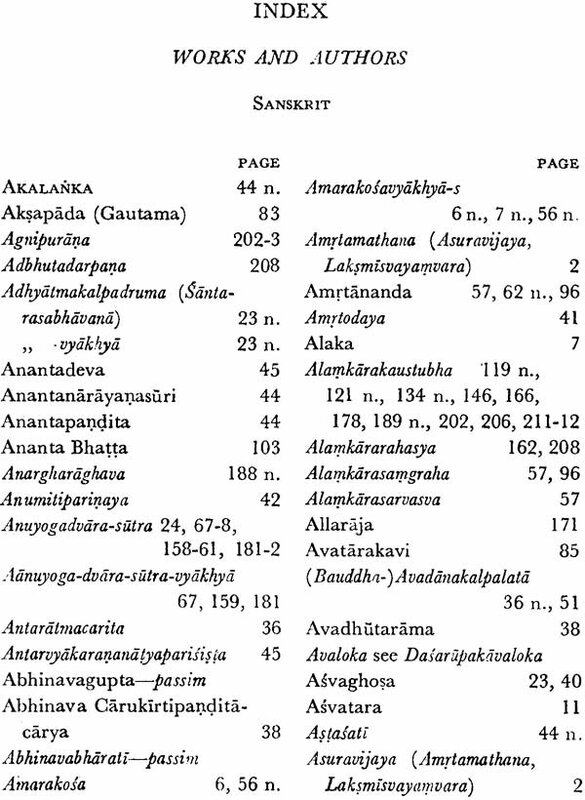 The Adbhuta- synthesis of Narayana; followers and critics and criticism of attempts at such synthesis (pp. 203-8).